3.5 stars. Why yes, I was a fan of LOST. Of course my mind was going to go there.Survival of the fittest brattiest? If you had dropped me into the exact same scenario as our book characters, I would have been dead within a few days. Fact.What is it about survival books which fascinates me? If I had to take a guess, it would probably be the ingenuity of people when push comes to shove. All of a sudden, a socialite (LMAO, on my first type, I wrote socialist by accident) and a chef are becoming team MacGuyver and rigging up plane wreckage and extra luggage to serve as a shelter and hunting gear (the bra slingshot was epic).I know that I would have eaten the wrong foliage and poisoned myself. Guess it's a good thing the survivors had a set of passenger notes on plant life in the area (how convenient! ).For those of you who've read On the Island...Who here was pleasantly surprised by how much they came to love the unconventional romance in that story? 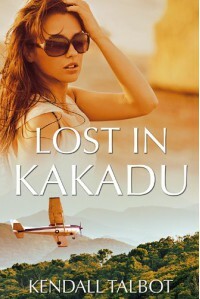 Well, you're in luck with Lost in Kakadu, I suppose. There's also a very unconventional romance which blooms from Lost in Kakadu, but it's not quite as much of a grabber. While I did come to eventually appreciate the long-awaited romantic aspect, it didn't resonate the same way with me that the one in On the Island did. However, I did get a chuckle out of Abi noticing Mackenzie's glistening pubic hair. Yeah...I don't quite get the fascination in mentioning more than once how someone's pubic hair glistened or shone.But it's all good, because the strengths of this story truly were with the survival aspect. I was right there wanting to know what would become of these characters, one of which I didn't even like for most of the story (okay, maybe I didn't actually warm to any of them)! That is how riveting the survival angle of the story was to me. Although, I have the feeling that a lot of other people will like this slow-to-build romance. It's hard not to start rooting for the characters at some point along the way, no matter how you felt about them at the start. How crappy of a person would I have been if I didn't want to see them succeed and find happiness again after surviving through so much personal loss?This is probably one of the better-researched tales of survival outside of a general fiction. I didn't expect as much detail in a romance book, and I think the reader is going to be pleasantly surprised at how much thought the author put into every aspect of survival, which was quiet a bit more than we even saw in On the Island (and I had no big complaints with that telling). I love it when authors don't allow us to assume that people are doing what they need to do, but instead choose to tell us what they're actually doing, and manage to find a way to do so which is entertaining.The half star point deduction is pretty much for my dislike of Abi. She showed a lot of growth toward the end, but I disliked reading through her eyes for a good portion of the book. This book provided from the publisher in exchange for an honest review.